A zombie idea is one which should be dead, but somehow is not; examples would be that the earth is flat, that autism is caused by inoculation,¹ ¹ that climate change is entirely man-made, ² ² that the tongue has specific places for specific taste classes ³ ³ ... Currently, perhaps, that politicians ought to tell the truth in order to be believed. I discovered in The Guardian something entitled the Long Read, which I found when chasing a thread, as one does. This ramble largely re-enacts that fumbling, but hopefully subsequent editing will tidy around the edges. Read what I wrote and not what you think I wrote. A zombie still looks, at first glance, as if it is alive, a live idea. That is a large part of the reason they’re still around. Of course, British humour perpetuates these to an extent; we think such things are funny – until too many people have fallen completely for a zombie, at which point the joke is on us. Zombie Economics takes the reader through the origins, consequences, and implosion of a system of ideas whose time has come and gone. These beliefs—that deregulation had conquered the financial cycle, that markets were always the best judge of value, that policies designed to benefit the rich made everyone better off—brought us to the brink of disaster once before, and their persistent hold on many threatens to do so again. Because these ideas will never die unless there is an alternative, Zombie Economics also looks ahead at what could replace market liberalism, arguing that a simple return to traditional Keynesian economics and the politics of the welfare state will not be enough – either to kill dead ideas, or prevent future crises. The Great Moderation: that the period beginning in 1985 was one of unparalleled macroeconomic stability that could be expected to endure indefinitely. Dynamic Stochastic General Equilibrium (DSGE): that macroeconomic analysis should not be concerned with observable realities like booms and slumps, but with the theoretical consequences of optimising behaviour by perfectly rational (or almost perfectly rational) consumers, firms, and workers. The Trickle-Down Hypothesis: that policies that benefit the wealthy will ultimately help everybody. Privatization: that nearly any function now undertaken by government could be done better by private firms. 1. Don’t trust your intuitions without doing the math[s]. 2. Just because a famous ecologist, or lots of ecologists, or a textbook, says something, doesn’t make it true. 3. You have to be careful about how you teach ‘classic’ ideas. The good news in all this is that zombies die in physical marketplaces. As Steven Poole points out: No one now buys Betamax video recorders, because that technology has been superseded and has no chance of coming back. (The reason that other old technologies, such as the manual typewriter or the acoustic piano, are still in use is that, according to the preferences of their users, they have not been superseded.) Well said, sir. 4 Austerity: Conceived from the puritanical idea that we must pay a penance for our sins, the Austerians (as we like to call them) insist that a post-bubble economy can be cured with spending cuts and tax increases, producing a balanced budget. When the United States tried this in 1938, it helped send the nation back into recession. More recently, Greece was forced to adopt austerity measures as part of its financial-rescue terms. It pushed the country into a depression. Austerity measures in Britain and Ireland and Spain—indeed, everywhere they have been imposed in Europe—have all led to recessions. Despite the wealth of evidence showing that this is a terrible idea, it refuses to die. 5 Tax cuts pay for themselves (supply-side economics): Sometimes bad ideas start as good ones. When tax rates are so high as to cause all manner of tax avoidance strategies—think confiscatory rates of 75 to 90 percent—reducing them makes sense and can change investor behaviour for the better. Where we run into trouble is when this concept gets extrapolated to an absurd degree. Claiming that any tax cut will pay for itself by producing greater economic activity has now reached that point. No, Virginia, cutting taxes 3 percent does not lead to more revenue. Get over it. 6 The efficient-market hypothesis: This is the mother of all academic zombie ideas. The concept is that markets are “informationally efficient.” That lots of self-interested investors hunt down every last data point about any given asset class or stock. And pricing perfectly represents all of the given information available at the time. Therefore, no one can outperform the markets for long. Except they have. Fund managers such as Peter Lynch, Warren Buffett, Ray Dalio and Jim Simons have consistently beaten markets over such long stretches that it cannot be merely by chance. Perhaps the even bigger anomaly that this concept runs into are the all-too-regular booms and busts—the massive mis-pricing of assets—that economic bubbles and crashes produce. 7 Markets can self-regulate: Another example of an idea that started out reasonably enough but soon after went off the rails. After 30 years of postwar economic growth, there was a credible argument that government regulations had become too costly, time-consuming and complex. With inefficiencies holding back small businesses, paring the worst of the regulatory burden should be productive. As so often occurs, this good idea was taken to an illogical extreme. Instead of removing onerous, expensive regulations, zealots such as then-Sen[ator] Phil Gramm (R-Tex.) argued against all regulations. Markets can regulate themselves much better than some bureaucrat or lawyer. Besides, the self-interest of companies and the efficient market would more effectively police behaviour than any government agency ever could. We know how that turned out. Ritholz then switches his list from zombies to something different, a rant at the gullible public in the context of the financial markets. As he points out, someone who makes it big, by luck or error, will not and does not perform well in the long term. Which doesn’t stop ‘us’ wanting to believe them. He points to institutional mandates, such as ‘publish or perish’ and leaves himself another essay on merely that one paradigm. He is right, they must change. This is the same as the underlying topic of the last essay, so I’ll add ‘do whatever sells the paper’. He includes ‘narratives persuade more than data’, which I think goes a long way to explain why that word narrative keeps occurring on the radio – and why I dislike its use, for it is ringing a bell that is saying “story, not truth”, definitely used in agreement with the quote. Maybe that means we have to find the story to tell a truth, but zombies are cultured from the story not quite truly founded. Maybe, indeed, it is the narrative we are trying to buy when we make political choices. Is that why we seem to confuse the story and story-teller? Top pic as usual the first thing grabbing my eye on doing an image search with the title. This from Pinterest. Yet again I think I failed to list all the places I visited, but this is most of them. A lot of the time I’m doing a google search and choosing from what appears there, not searching all of what surfaces. Does that make this a superficial study? 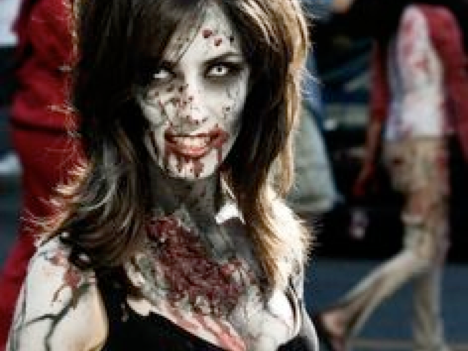 https://oikosjournal.wordpress.com/2011/06/17/zombie-ideas-in-ecology/ which details zombies in ecology, particularly the intermediate disturbance hypothesis (IDH). 1 Correlation and causation issues. Essay 232. Blame Andrew Wakefield, read the link, research this for yourself, but get it out of your head as a belief. While you’re at that, revisit the idea that inoculations are A Good Thing. If Wakefield was flying a kite or building a trojan horse or other terms for deliberate deceit, he succeeded in alienating himself, while generating a lot of work and funding into relevant research. Unfortunately, negative research gets a poor press, so there was an awful lot of work done and still this zombie has legs. 2 Look here for the long explanation how this is a zombie. But (again) read what I wrote, not what you think I wrote. 3 Link was on the footnote number above. But see also here. The tastebuds test for things called sweet sour, salt, bitter, and umami (what? glutamate), possibly also ‘fat’. This experiment failed when I did it in school in the early 60s. Of course it did; the taste buds are evenly distributed across the tongue. It should be used in school to prove that theories can be false, when instead it is used too often mistakenly to teach that you will agree that the rule is so. Indeed, I could see it as having really good value within a PGCE course. Of course the tip of your tongue tests well for sweet and salt at the side; but the tip tests well for all five ‘tastes’, so the bit of the theory that is wrong is the part that says there are speciality parts of the tongue. The original paper declared that threshold sensitivity varied across the tongue and mapped that difference. The qualifier was lost, killing the (true) value of the work and creating a zombie. 5 Zombie Economics: How Dead Ideas Still Walk among Us, John Quiggin, Paperback | 2012 | $16.95 | £12.95 | ISBN: 9780691154541 288 pp. | 5 1/2 x 8 1/2 | 4 line illus. Zombie Economics takes the reader through the origins, consequences, and implosion of a system of ideas whose time has come and gone. These beliefs--that deregulation had conquered the financial cycle, that markets were always the best judge of value, that policies designed to benefit the rich made everyone better off--brought us to the brink of disaster once before, and their persistent hold on many threatens to do so again. Because these ideas will never die unless there is an alternative, Zombie Economics also looks ahead at what could replace market liberalism, arguing that a simple return to traditional Keynesian economics and the politics of the welfare state will not be enough--either to kill dead ideas, or prevent future crises. 6 Belief is the right word: a leap of faith in a space with little or no supporting evidence. I say false belief is based on proven untruth and a validated belief is one where there is no conclusive evidence. Example: there is no evidence that the universe is not created by a god or gods. While Darwinism does explain the development of biology, creationism requires conspiracy theories to succeed, while Darwinism in no way denies that god/gods might be responsible for the existence of evolution. For example, see this 1927 Nobel winner. 7 Krugman Read this to correct yourself on revisionist history, but do your own research too. No maths involved. No, the government didn’t force banks to lend to Those People; no, Fannie Mae and Freddie Mac didn’t cause the housing bubble (they were doing relatively little lending during the peak bubble years); no, government-sponsored lenders weren’t responsible for the surge in risky mortgages (private mortgage issuers accounted for the vast majority of the riskiest loans). “Every dollar our government borrows is money that isn’t being invested to create jobs. And the uncertainty created by the debt is one reason why many businesses aren’t hiring.” Zombies 2, Reality 0. 1. Disturbance reduces species’ densities, thereby weakening or eliminating competition and preventing the competitive exclusion that occurs in undisturbed environments. But too much disturbance kills off all but the most disturbance-tolerant or quickest-recovering species, hence intermediate levels of disturbance support the highest diversity. 2. Disturbances interrupt competitive exclusion by temporarily reducing all species to low density and weakening competition, thereby allowing all species to subsequently increase. 3. If, due to fluctuating environmental conditions, the identity of the dominant competitor changes on an intermediate timescale, no one species will ever have time to exclude the others and all will coexist. Overly-slow fluctuations will allow exclusion to take place before conditions change. Species will average across overly-fast fluctuations, and whichever species competes best on average under the full range of environmental conditions will exclude the others. 4. Don’t trust your intuitions without doing the math. Your intuitions about ecology, unaided by mathematics, are mostly worthless. Don’t feel insulted; mine are too. So are everyone’s. Ecological systems are complex, dynamic, and characterized by feedbacks rather than ‘one-way’ causality; verbal intuitions about such systems are notoriously unreliable. The people who originally developed the IDH are some of the smartest and (deservedly) most influential ecologists of all time; this post is not a criticism of them personally. The IDH is not a dumb idea. If it was, it never would’ve ended up in all the textbooks. But just because it wasn’t dumb doesn’t mean it’s not totally wrong. Mathematics (by which I don’t mean primarily mean numerical simulations, I mean analytical techniques like algebra) is a tool which makes us smarter. It forces us to precisely and explicitly define all our assumptions, and to logically work out all their consequences. Words are ambiguous, and logical reasoning of any complexity is immensely difficult. If your verbal hypothesis really is logically valid, you should be able to express it in mathematical form. Probably, you’ll discover that your idea doesn’t work precisely the way you thought it did, or at all. Which means that the math has shaken up your intuitions, and hopefully helped to replace them with better intuitions. And no amount of data is a substitute for doing the math, because data doesn’t interpret itself, you interpret it. Connell (1978) took his inspiration for the IDH from his tremendous empirical knowledge of tropical forests and coral reefs—and it didn’t protect him from the zombies. 5. Just because a famous ecologist, or lots of ecologists, or a textbook, says something doesn’t make it true. The IDH probably would never have achieved the penetrance it has if it hadn’t been developed by some of the most famous ecologists of the last 70 years. That led some ecologists to try to test the IDH. After all, if the G. E. Hutchinson or the Joe Connell proposes a hypothesis, the rest of us sit up and take notice. That led other ecologists to attempt further tests; once a topic becomes ‘hot’ lots of people pile in just because it’s ‘hot’. And once that body of work reached a critical mass, it had to go into the textbooks, which are written and updated to reflect the current state of the field. None of which changes the fact that the IDH doesn’t stand up to logical scrutiny. Remember my earlier post on the importance of contrarian ecology? Well, the penetrance of the IDH is what happens when too few contrarians arrive too late to save us from the zombies. 6. You have to be careful about how you teach ‘classic’ ideas. I teach Hutchinson (1961) because, in order for students to appreciate what’s right about modern ideas like the storage effect, they have to appreciate what’s wrong with classic ideas like Hutchinson’s. I do not teach Hutchinson (1961) as an idea that was ‘further developed’ or ‘clarified’ by subsequent workers, because that just encourages students to gloss over challenging, non-intuitive ‘details’ like nonlinearities and nonadditivities and just focus on seductively simple, apparently easy-to-understand claims. Frankly, I’d prefer not to teach Hutchinson (1961) and other ‘classic’ IDH ideas at all, but because these zombie ideas still walk among us, I’m worried my students will be viewed by others as ignorant if they haven’t at least heard of these ideas. 9 There is an issue in iWeb with what I might call presumptive layout. One evident here is that if I have a numbered list, whatever the rules are that govern that, they have issue with formatting the first paragraph the same as the subsequent ones. I have not discovered control over this. It took me more than a dozen attempts to fix this at the foot of essay 199 and I didn’t discover what I’d done that succeeded (a win without a cause) nor did I succeed in repeating that here. As in footnote 8, where nudging the count to continue past 3 was done by adding 2 or 3 spaces beyond the ‘N. ‘ count. then adding a return at the bottom so ‘it’ adds ‘N+1’ – and at that point the preceding paragraph is re-formatted to match the style I do not want.